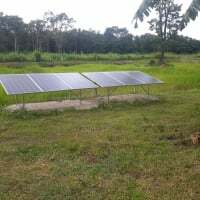 I am a new comer to off grid solar. I am gathering information and advises for a small 12V system for my summer home in the Caribbean. 1 3000w Xantrex pure sine Charge controller. Solar panels combined (series/parallel) using the Y connetors on concrete roof about 25feet from the MNPV6 combiner box. The combiner box will be located at about 30 feet from the Charge controller. the batternes are at 6feet away. All the cable will be fished thru 1-1/4 PVC conduit on the roof as well under ground to the house. A) size Breaker to use in the combiner box (15 or 20A)? D) do Ineed more battery and or more panels? This solar system will be used 24/7 for a mid size refriginator/freezer, and a 17 cubic feet freezer. There will 3 or 4 Led 15w lights in use for 3 to 4 hours at night. Also 3 ceiling fans for a few hours when the 8000btu air conditioner (power by a generator) is off. There will be cell phones to charge as well as the use of 2 laptops for about 2-3 hours a day. All advises or comments are appreciate. I think for the loads you describe, a 12v system is too small. You may consider going up to 24v or 48v if possible. also you do not say the voltage input of your inverter. This will determine the system DC voltage. You then connect batteries in series to get the voltage you need to power the system. Other than that, it seems you need to do your load calculations letting you know the number of Watt Hours you will use in a day, and then determining how many days you want to be able to go without charging (due to clouds etc). This is the only way to design a successful system that will supply those loads daily, and be able to recharge the batteries in a timely manner. Describing your loads (ie. a fridge, freezer and 4 LED bulbs) does not tell you what your daily loads will be. But with a mid size fridge alone, you are probably talking on order of 1800-2700 watts per day (I am guessing). This alone moves into a medium size system from a small system. You need to use a Kill-O-Watt meter on the fridge and freezer for a few days, Then divide the number of watts used by the number of hours ran then multiply that by 24 hours to get the number of Watts a device or appliance uses in a day. This is the best way to get a true total load calculation. These are not exact ... but a good rough estimate. But just looking at what you described, I can see needed upwards of 2500 watts (Watt*Hours -BB.) per day. You forgot to multiply the amps for your 12 volt system. The wattage is the same, your math is wrong and misleading. The only advantage to running high voltage is the ability to use thinner lines. The power is the same. And with a Midnight controller, he can run his pv in series to 48 volts, into a 12 volt battery bank that is much less dangerous to children or pets. This "myth" that somehow high voltage battery bank is benificial to "watts" is just that, a myth. What you want is to run your battery bank to the voltage of your 3000 watt inverter's set voltage. Your midnight will take care of higher voltage from the pv, up to 48 volts I think. The directions are very clear, the volt, watt, amp, and total power are very accurately tracked, and can be reset at any time, giving you the ability to perform real time diagnostic evaluations on your systems performance and /or deficiencies based on your draw and input seasonally. Watt meter power analyzer will tell you exactly how much your pulling and you can time how frequently it comes on. No guess work, its a must (only 14 bucks) for anyone learning to live off grid. But Panels do perform better when running nice and cool. I dont think you add amps when referring to battery storage (I could be wrong). All I was noting in my math was battery storage. A 200Ah battery bank at 12v will only store half the Power of a 200Ah battery bank at 24v. If I could build my system over again, I would go 48v and 8 225Ah Trojan T105 Golf Cart Batteries. This would have been less money in batteries than my existing 4 L16 435Ah batteries, Been easier to move around each battery, and would have had more storage capacity. Dan, when constructed to code, PV arrays, wiring and batteries are no more a danger than any tools in a workshop. I am only going to comment on several aspects of this.......here PVC conduit is not allowed or frowned on on the roof or attic of dwelling.......code in the Caribbean? I don't know if they have code in Caribbean! Solar panels and heat. Make sure that air is free to flow behind and underneath the panels. Common use here is 4 inches of space...free air There I would give them more air behind if you can. Don't mount them flat down! 12 volts with a referigerator and a freezer..........don't think that is a wise choice......I have 2 referigerators and a freezer on my 24 volt system.....BUT......they are super efficient DC permenant magnet motors referigerators specially made for solar use.........these are not cheap for the referigerator but way less expensive for the whole system. They run directly from the battery, no inverter......approx. 200-250 watt hours/day.each! .....$800-1600 each. I could not do that much referigeration on my 4 controller dual bank 24 volt system if I used Costco cheep referigerator's check out the Sundanzer units at wind-sun.....mine are not Sundanzer......there are others....some are vaporware. I am really interested at information about cable size for a distance of about 65 feet from the panels Y connectors to the Combiner Box to the Charge controller. This to minimize voltage drop, and also would I need to use 15A or 20A breaker inside the combiner box. How are the panels configured, the size of the conductors will be dependent on the voltage, higher voltage = lower current smaller conductors. Since you have a MPPT controller it would be possible to series 2, parrallel 2, using 10 AWG the voltage drop would be approximately 2.93%, which is acceptable, 8 AWG would be better at 1.8%. The breaker or fuse for each string would be 15 A, its not essentialto have two, there could be a single 30A, but having 2 is handy for trouble shooting. Edit. I made the mistake of using 80V the VOC instead of VMP which would be ~65V, so the percentage values will be lower, here is the revised calculation. 3% or less voltage drop is what is needed.